Get your finest dresses and suits on and pick out the wildest and most imaginative hats you can find because once again it is time to dive straight into the vivid and fantastic world of the Royal Ascot racing festival held every year in June. The history of the course in rich and vibrant with the first races that were staged a t Royal Ascot actually dating back to 1711. It is because of this fine pedigree that a stiff dress code in enforced at the Royal Ascot. The men must attend in suits and top hats and the ladies must arrive in suitable dresses, with none of their midriffs being exposed and they also MUST wear hats. 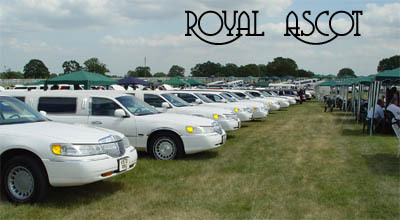 With such a venue of such a firm stature why not round off the occasion by travelling to Royal Ascot in the most superb of style courtesy of one of our hired black limousines. Every year over 300,000 people attended what is considered to be one of Europe’s top racing meeting by people from all over the world. Any fan of the ‘sport of kings’ will be treated to some of the most sought after racing meets in, not just the UK, but in the world of horse racing in general. Races such as; The Ascot Gold Cup, the Queen Alexandra Stakes, the Prince of Wales’ Stakes and the Royal Hunt Cup are all firmly contested here. One of the main attractions of the Royal Ascot calendar is, of course, Ladies day. On this day, the feature race of the Ascot Gold Cup is run and the day is generally considered to be one of the busiest days. On this day you usually get the most extravagant hats being worn so I might also suggest you get designing on your own unique style which will be sure to blow away the competition. One thing I must suggest and stress is that you must book early for your Royal Ascot and limousine experience as the dates and tickets often get booked up rather quickly. Whatever style you decide upon we will have a suitable limo to hire that will accommodate you, your friends and your big hats too. Let us make your Ascot experience that much better by booking either our black or pink stretch limousines or hiring top of the range Hummer limos to round off one of the best events and experiences to be attended in the whole of the country.